We’re really happy that our tiny house trailer has made it through inspection and is now finally registered. Tiny house trailer inspection day was such a crazy day! I’m glad we don’t have to do it again, haha. With the tiny house trailer inspection out of the way, we can finally focus on building our tiny house! This is so exciting. The moment we’ve been waiting and preparing for months has finally arrived. After watching hundreds and hundreds of videos about tiny houses and how to build them, it’s time to start building our very own tiny house. Eeek. Our tiny house build will happen in seven big steps: floor, frame, exterior cladding, roof, interior cladding, interior. Before we start putting our floorboards down we will prepare the trailer by adding DPC to the trailer. DPC stands for ‘damp proof course’ and is supposed to prevent moisture from going into the floorboards and also into the trailer. This DPC basically works as a membrane between the metal trailer and wooden floor. DPC is a common building material and available in every warehouse. 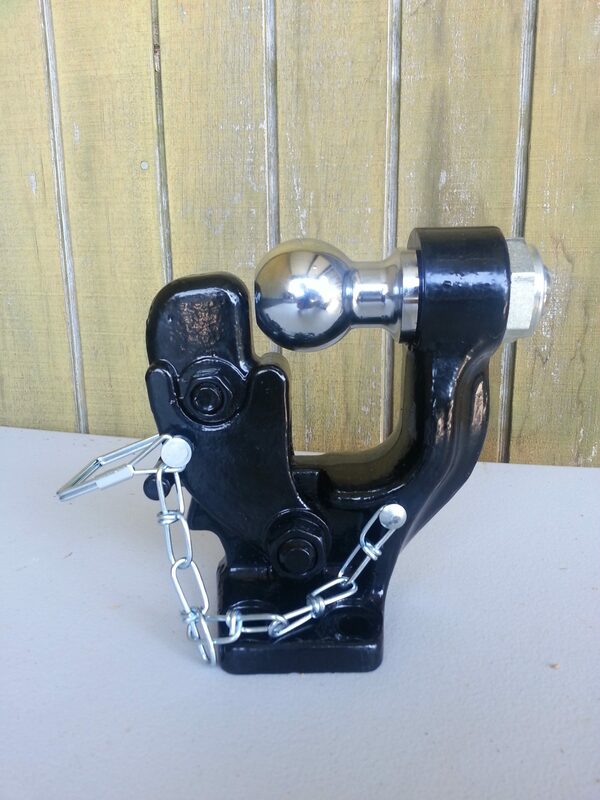 However, we were really lucky because we found our DPC at our local tip shop. Can you believe it? It cost us next to nothing and works just as well. On top of that, we used recycled materials for our tiny house build which would have otherwise ended up in a landfill. Equipped with heaps of DPC sheets from the tip all left to do for us was cutting it into strips. A lot of strips. And glueing them to the trailer joist and frame. This took us a few days, mostly because of the intense sun but our tiny house trailer is now fully covered with a membrane which hopefully does its’ job! We’re super excited because our tiny house trailer “arrived” today! We have waited months for this day and now it’s finally happening. Soon we can start building our tiny house. Exciting times are ahead of us. 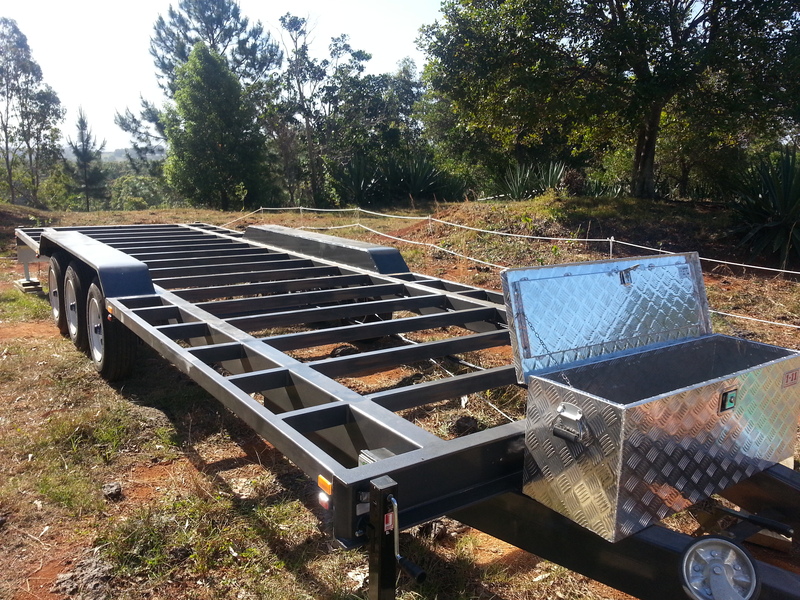 Our trailer is made of steel with 15 joist and 3 axles for more stability and to balance out the weight. 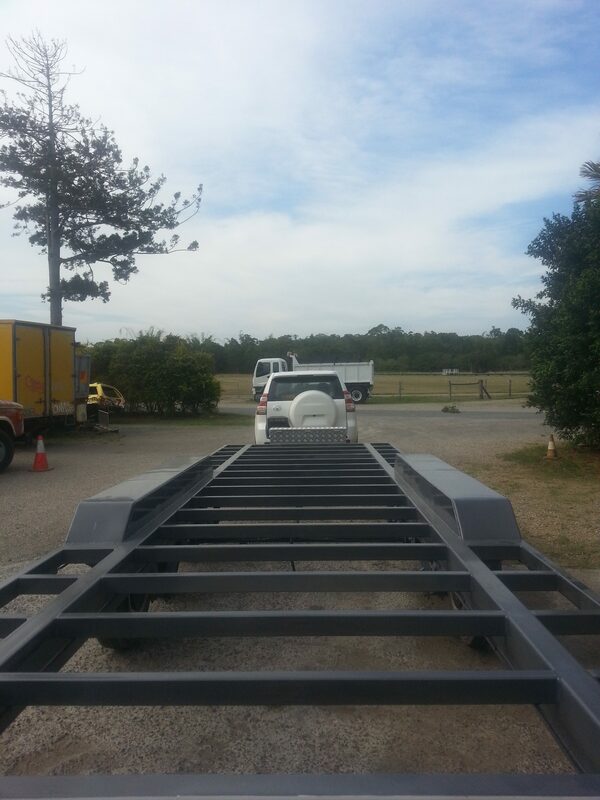 The trailer is 9.6 m long including A-frame and 8 m long without it and it is 2.4 m wide. This means that our bathroom, kitchen and lounge space will be spread out over a length of 8 m. Width-wise we could have maxed it out to 2.5 m but we kept in mind that we have to add cladding to the house. 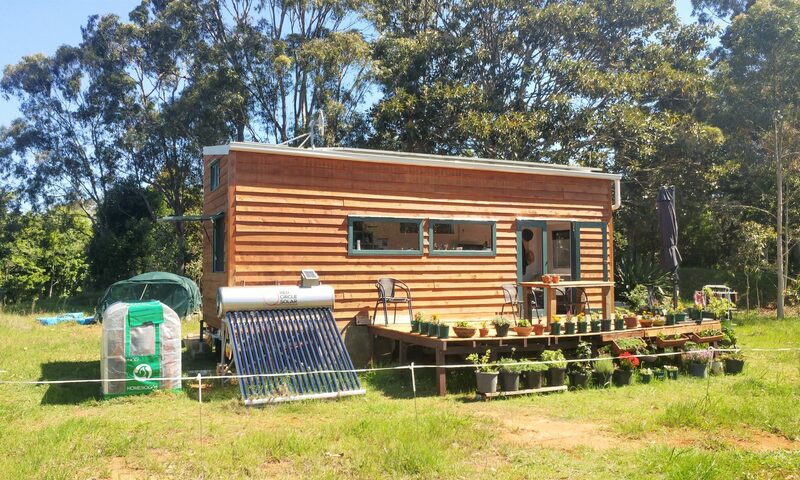 So in order to keep it within the specs for trailers within NSW regulations we only went with a width of 2.4 m.
Unfortunately, our tiny house trailer is not galvanised but only painted. This is especially problematic in our area because we’re located on the coast. I have spotted quite a few rusty bits already and frantically started painting and spraying them. Since the trailer is new the rust is only on the surface, so it’s not too dramatic at the moment. But we will have to maintain the trailer regularly to avoid corrosion. Finally having our trailer on-site is fantastic! That means that we just got a little bit closer to building our tiny house. Before we can start though we have to register this beast of a trailer.